As a business owner, it's important to be aware of how your business is perceived and how that perception can affect your success. Most people will not stop and tell you that they are not coming in because your parking lot looks unsightly. But a good first impression is key to inviting new and recurring business into your location. Potential customers are more likely to shop at a well maintained location. 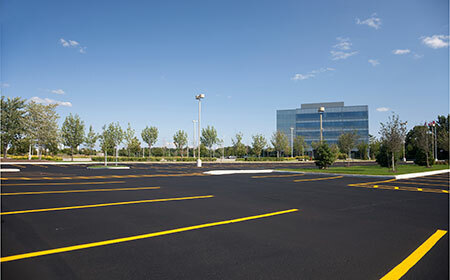 Having a nicely paved parking lot with smooth blacktop makes a huge impact. If your budget does not allow for a full paving renovation, asphalt patching and/or seal-coating will often do the trick. If your property is located in Suffolk County , Nassau County , Long Island, Queens or any of the five boroughs of NY, another fact to consider is the vastly-changing seasons and weather conditions, and what the elements do over the course of time to the exterior of your property. The parking lot is most suseptible not only to changing weather conditions, but also the wear and tear of every-day traffic, snow removal, litter, motor-oil, etc. It's important to properly maintain this critical part of your property. A well-maintained parking lot can prevent flat-tires caused by pot-holes, slips, falls and accidents. In which case, it's an investment that could potentially save you a lot more money than it costs. Contact us today to set up a free estimate for your paving project.